Christmas Eve is upon us & for once I am feeling rather organised. 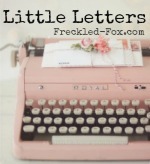 So I've been hop, hop, hopping around some beautiful blogs when I came across a feature called Little Letters. A link up feature where people can write a little letter to any one or any thing!! I have been a very good girl this year, I think! I have done a lot of learning, I have enjoyed a wonderful year with my hubby & doggy & I am feeling much better in my mood. I went back to work part time, & I think I am coping just fine. I know I'm a bit late any requests but that's lucky as I feel already blessed this year. So my only wish would be for a happy & healthy new year. Oh & anything you could do to make sure we have a smooth house move on the 11th of January would be gratefully appreciated! Dear Mr Brown - you are amazing. Dear Brown family - I love you lots & so happy to be part of a caring bunch. Dear family & friends - I couldn't have made it through this year without you. Dear movers - thanks for your help in advance! Dear new house - look out we're coming! And I think that is enough!! What a lovely feature? Do you have any one you would like to write to?